I'm so excited to post these photos. I've gone with an almost all black outfit - excluding my new oversized trench coat from Zara which is my new favourite outwear piece in my wardrobe because it's so lightweight. I also love that it's in this light/"stone" colour (according to their website) so that I don't wear all black outfits all the time - which I don't mind, but it's nice to change things up a bit when the season changes. 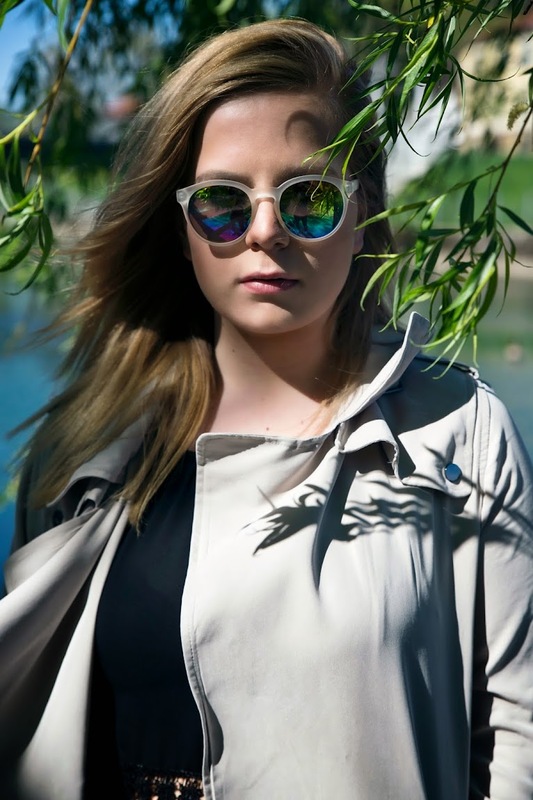 For a pop of colour I've decided to include my "rainbow" sunglasses that I just adore for the spring/summertime. oh love that trench coat! nice look and photos! love your outfit. cool for spring. would you be interested to like each others FB page and follow on instagram? pls let me know and I will like/follow back asap. Hi thanks for visiting my blog. I had followed u back on gfc. However bloglovin is forbidden in my country for a while i can follow back when goverment opens it:( what about instagram and fb? what a marvellous shooting! You're beautiful! Love the sunnies so much!! Meni so pa očala všeč in scena ter na prvi sliki popolnoma vse!